1. Does image SEO still get me more traffic even after Google changed its image search layout? Marcus Pentzek: In Google image search, the user is first presented with an overview of thumbnail images. Clicking on an image displays the selected image at medium size, plus some additional information about its website of origin. This may be sufficient for some topics and/or users. However, in most cases, users who are specifically looking for images will click again on the image – leading them to the actual website and generating traffic. 2. How do I know whether images are relevant for my niche or not? 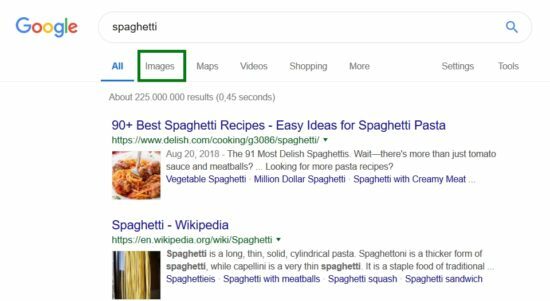 If the organic search results contain URLs from image-heavy platforms like Pinterest, then you can assume that users are looking for inspiration – and that your topic will be capable of generating image-driven traffic. 3. Why should I bother optimizing for images? People looking for images aren’t likely to convert are they? Marcus Pentzek: Whether traffic converts or not will always depend on the topic. Users who are looking for furniture might start by looking for inspiration with an image search and then, if they find a product they like, move through to the shop page and place an order. 4. If videos are important, then do I need my own videos? Or can I just embed good YouTube videos to increase my time on site? Marcus Pentzek: If videos are important for my niche then it’s easy to embed YouTube videos as part of my onpage optimization. This will improve my user signals – time on site will go up if people watch the videos and bounce rate should go down. Malte Landwehr: You can even incorporate YouTube videos and rank with these as the source in a video carousel. However, this kind of high-jacking doesn’t always work. And the websites who have the most success in video carousels are normally those that embed their own videos. 5. If I rank with a video, it’s normally my YouTube video. What benefit do I get from that? Malte Landwehr: Depending on your preferred video strategy, it could well make sense trying to generate views for your YouTube videos. This could, for example, contribute to branding and marketing goals. Or the video could include information and links that encourage users to visit your website. If this isn’t what you’re trying to achieve, then this obviously isn’t an approach you should take. 6. Are SERP Features different on mobile and desktop? Marcus Pentzek: The clear answer is yes and no. For product searches, there is often an image slider in the mobile search results (see question 9). The positioning of SERP Features is also different on a mobile device. On desktop, shopping ads, knowledge graphs and knowledge panels appear in a right-hand sidebar alongside the organic search results. On mobile, however, they are integrated above the organic results. There are also specific SERP Features, most notably AMP, that are unique to mobile search. Marcus Pentzek: With AMP (Accelerated Mobile Pages), Google makes it possible to clone your websites, creating a code that is designed for a quick mobile experience. This code is hosted by Google itself, and the website is displayed in this form in the mobile search results. 8. And how important do you think AMP is? Malte Landwehr: AMP is certainly a must-have for news publishers. All other websites should first see if they can build a fast website without using AMP. If not, then AMP is a useful way of producing and providing a quick mobile website. 9. Do you know these image slideshows that you get on mobile? How can I get one of those? Malte Landwehr: As Marcus already mentioned in question 6, image sliders are displayed within the search results for some product searches on mobile. This means that, on mobile, Google’s standard image integration becomes a slider. And it’s not hard to answer the question how you can get an integration like this: The same image SEO factors apply as normal. 10. If I rank with a direct answer, then I don’t necessarily get more traffic, do I? Why should I optimize for these? Malte Landwehr: This depends on the type of question being asked and the type of answer being provided. 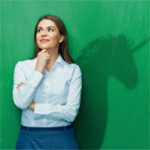 It is entirely possible for a direct answer to generate traffic – and even traffic that converts. This is most effective when the snippet displays an incomplete answer. By “incomplete”, I mean that the line “More items…” appears between the excerpt and the URL. This increases the likelihood of users clicking on the landing page that provides the featured snippet. Even if the featured snippet directly and completely answers a question, and I think it probably won’t be generating much traffic, then I’d always rather occupy this position than see a competitor there. I’ll at least be benefiting from the branding effect. Plus I’ll be dominating voice search! 11. Are Featured Snippets and other integrations part of Google’s long-term plan to take traffic away from SEOs? Malte Landwehr: It’s the same old story. When websites give Google their data, then they enjoy a short period of increased traffic and then at some point Google creates its own solution. Several years ago, the use of structured data led to an increase in Rich Snippets (and higher CTRs). 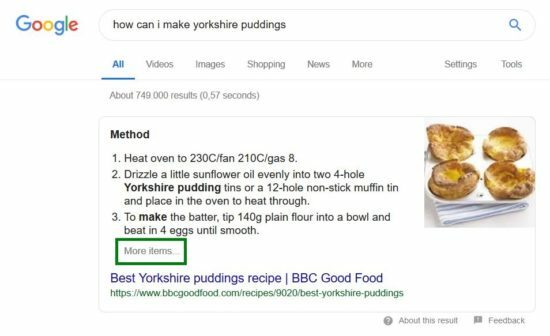 Although today there are many more websites that mark-up their structured data, there are fewer of these enhanced snippets in the SERPs. Instead, there are more direct answers and knowledge panels that are provided directly by Google! We currently see something similar happening with Google Jobs. The job platforms that provide Google with the data, first get traffic to their websites. But in doing so, they also provide the foundation for Google to potentially become the largest job platform on the market. Marcus Pentzek: I don’t worry about this question. The only other option would be if all the online players in an industry joined forces and collectively denied Google their data. 12. Which SERP Features currently have the greatest potential or pose the largest risks? Malte Landwehr: At the moment, I see the biggest traffic potential coming from Featured Snippets. And the largest potential traffic killers are, for me, currently the integrations that Google displays in some countries for job, hotel and flight searches. These aren‘t just often extremely large, in terms of how much space on the search results page they occupy, they also do a very good job of meeting the needs of the searcher. 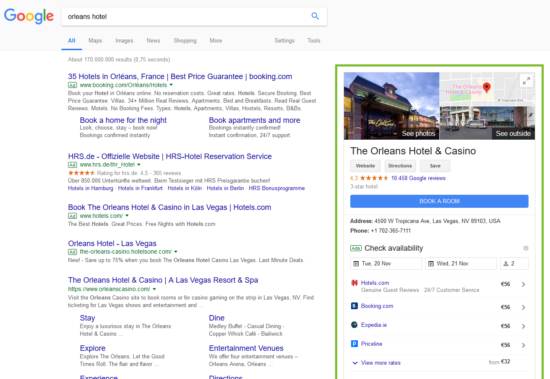 The following example shows how the entire sidebar for the search query “orleans hotel” is filled with hotel offers, hotel evaluations and events. 13. Do you have any recommended reading for someone looking to find out more about Featured Snippets? 14. How can I influence the contents of the Knowledge Panels and answer boxes that Google provides, when the data that is drawn from the Knowledge Graph? Marcus Pentzek: Google pulls data from various different sources. If we are talking about information related to your company, then Google will take information from the company website and from Google My Business. So this data should always be marked up well. For more general information, Google likes to take data from Wikipedia or uses data that it accumulated by purchasing the open-source knowledge platform, Freebase. 15. How does Google choose which websites to rank for SERP features? Do I stand a chance with my small website? 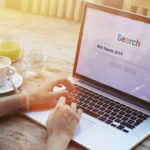 Marcus Pentzek: If data have the appropriate mark-up, then small websites also have a good chance of appearing in Google’s various SERP features. This includes mark-up in line with schema.org, e.g. for Rich Snippets, and structuring data in a way that Google can easily understand it, e.g. through the use of tables and lists. 16. Which structured mark-up works best? Marcus Pentzek: Google is happy to accept JSON-LD. A good rule of thumb is: The better you structure your website with schem.org and HTML mark-up, the easy it is for Google to understand your content and to reward you with position in additional SERP Features. 17. Which SERP-Features do other search engines like Bing and Baidu have? Marcus Pentzek: On Baidu, around half of all search results include an image integrated into the snippet. This is pulled by Baidu from the ranking website, which makes image SEO particularly important. Structured data from schema.org, however, isn’t read automatically by Baidu, but it can be added in the Baidu Webmaster Tools. 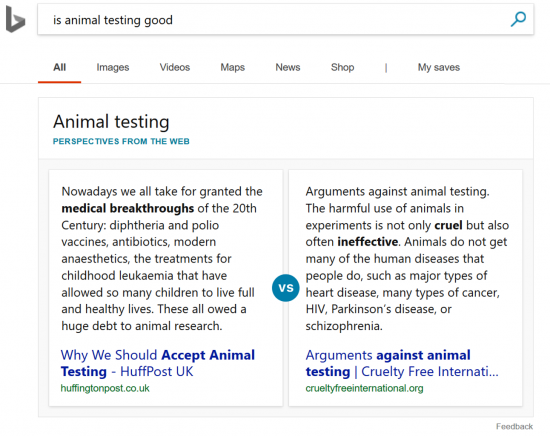 Malte Landwehr: Bing has developed an exciting solution to one of the problems of Featured Snippets. Its so-called “Perspectives from the Web” presents two opposing arguments, meaning that effectively two websites are ranking on position zero. 18. How can I get my website ranking in the news listings? Marcus Pentzek: The SERP Feature “News Listings” is filled with results from Google News. This means that Publishers have to be registered with Google News to appear in the News Listings. For Google news, an important criteria is how up-to-date information is. If there has been a recent development in one of my relevant topics, then this should be covered on my website – ideally with a new article. 19. How can I appear with images and prices in the product listings? Marcus Pentzek: This used to be done with Google’s free service, Froogle, that let merchants list their products for free. In 2013, the service became pay-only and was renamed Google Shopping. 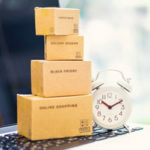 Now merchants can participate in an auction (via comparison shopping services) to have their products appear in the shopping units. Interested in doing your own analysis? 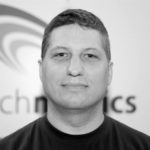 Hello, my name is Marcus Pentzek and I’m a Senior SEO Consultant at Searchmetrics. I do what I can to advise ansd assist our Suite customers with their search engine optimization needs. 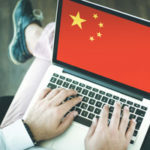 My passion is international SEO, including China, but not just China! Do go ahead and discuss what I’m writing here by leaving your comments – and you can also find me on LinkedIn.